Arcade cabinets tend to take a little punishment over the years. Time really does take it’s toll on your arcade cabinet and sideart. In this post, we’re going to discuss how you can restore some of the life back in to your arcade cabinet by laminating it. One of the most popular parts of our old website, Tim’s Arcade Restoration, was a post that we put together about laminating an arcade cabinet. We thought that we would revisit this topic in this post and provide some additional information that we forgot to add the first time. Also, I thought for nostalgia sake that I would repost the original article on the site for those of you who haven’t seen it. Yep, we’ve definitely come a long way! Well, enough reminiscing, let’s get started. Before we begin the lamination process, lets do some prep work. We started off by using an electric sander to sand our cabinet almost down to the bare wood. This allows the spray adhesive we use for the laminate to stick better to the cabinet. After sanding the cabinet, we took some bondo and filled in some of the holes and rough areas. Once the bondo hardened, we sanded it down to make it even with the cabinet. While this prep work can be time consuming, it can really make a difference in the quality of your laminating job. With the prep work complete, we can now start laminating our cabinet. Laminating a cabinet requires three things: laminate, spray adhesive and a laminate router. You can purchase these items from your local hardware stores such as Lowes or Home Depot. You can also follow the links below to purchase these items. We usually use a sheet of black laminate (4′ by 8′) per cabinet side. You should have enough left to also laminate the top and the front depending on the size of your cabinet. These sheets are typically priced around $50 each. The spray adhesive that we recommend is High-Strength 90 Spray Adhesive by 3M. It usually runs around $15 a can and most jobs can be completed with one. Laminate routers vary in price depending on brand but you can get a basic one for around $100 or less. Buy 3M High-Strength 90 Spray Adhesive from Amazon.com now! Buy a Porter-Cable Laminate Trim Router from Amazon.com now! Let’s start off your laminating project by measuring your cabinet and tracing it out on the laminate. Remember to add 4 or 5 inches to your measurements to make sure that every part that touches the cabinet has spray adhesive on it. Take the spray adhesive and apply it to your arcade cabinet and laminate. Spray the laminate only in the traced area that you are going to apply to the cabinet so that you don’t waste your spray adhesive. After this, wait 10 minutes so that the spray adhesive can start creating a bond with your cabinet and laminate. Once you have waited 10 minutes, we can now apply the laminate to the cabinet. While you can do this yourself, it is nice to have help as the laminate can break if you are not careful with it. Line up the cabinet with the traced area on your laminate. Make sure that the laminate hangs over at least 2 inches on each side of the cabinet. With the laminate applied, push on it and wipe it down with a cloth so that it bonds with the cabinet. Let it sit for a minute while you get your laminate router ready. Now that we’ve got the laminate on the cabinet, we can now use our laminate router to cut off the excess. Make sure you use a laminate router as sometimes regular routers don’t work as well on laminate. Also, make sure you have a laminate cutting bit as well. Take a look at the bottom edge of your cabinet and adjust the depth on your laminate router accordingly. It might take you a few tries to get just the right depth but once you do you can fly around the rest of the cabinet. With your laminate router adjusted to the right depth, start tracing the outside of the cabinet to cut the laminate. Remember, try not to force the router around the cabinet. It should move easily around with very little effort. After you’ve cut the majority of the excess laminate off, go ahead and trace it at least one more time to remove any small pieces that are still attached to the cabinet. When you have finished cutting the excess laminate off, you can retrace the cabinet with the laminate router using a 23 degree bit. This is nice because it does give the cabinet a sharp looking beveled edge, however, it also allows you to see the edge of the laminate. We usually just take a sponge style sanding block and go around the edges to sand off those rough spots that are left over from the laminate router. Of course, you want to repeat this process with the other side of the cabinet and perhaps the front and top. Once you have done this, your laminating project is complete. While it might take a little more effort than painting, laminating an arcade cabinet takes less time and the results are typically just as good if not better. It really gives new life to cabinets that have been beat up over the years and allows you to easily apply any sideart that you have. Please see our comments section if you have any questions or suggestion about our site or this post. Any idea where the solid black laminate can be purchased? We usually purchase our laminate sheets at Home Depot. They usually cost us around $50 a sheet and a sheet is good for one side of an arcade cabinet. Thanks for your question and let us know how your laminate project turns out. 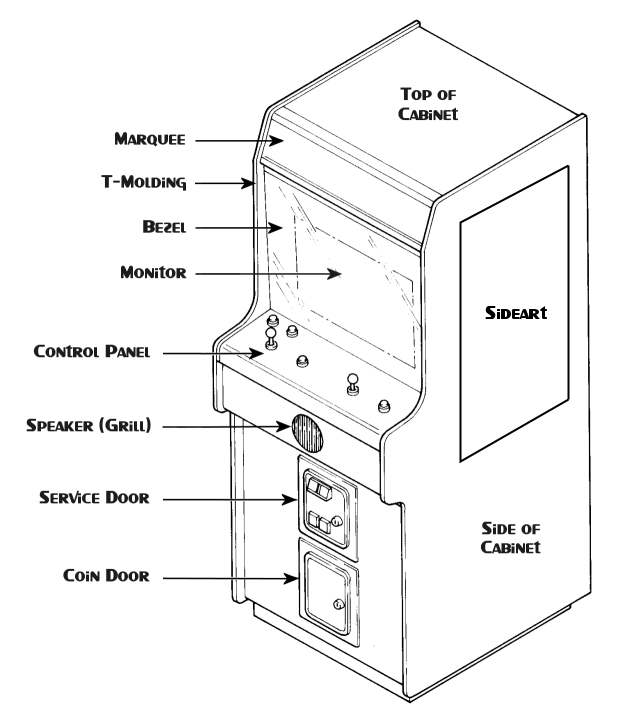 Before beginning the lamination process…did you remove the arcade internals and the monitor? In this particular instance, we did remove all the parts before we started laminating the cabinet. Of course, this is a not a requirement but it does make moving the cabinet around a bit easier. When we laminated the Tron cabinet in our original post from Tim’s Arcade Restoration, we did not remove any parts. The choice is really up to you but the lamination process we describe should work either way. We have also featured your question on episode 16 of our Q&A podcast. Please listen to it for more of our thoughts on your question. Thank you for your question and good luck with your future repairs.